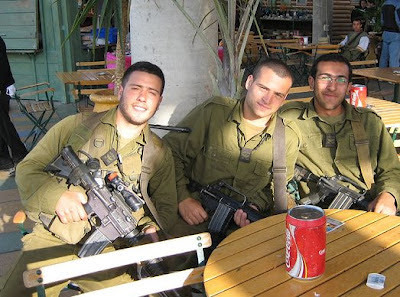 Some Israeli soldiers - just look how young they are. This week I helped friends of mine give a send-off party for their 18-year old son. He wasn't going to university or work in another city. No, he was off to join the Israeli army. This was the first time for me to experience (second-hand) what nearly every Jewish family in Israel undergoes. Children are given birth to, tucked in safely at night, send to kinder garden, given their first bicycle, allowed to attend their first pajama party, given a bar/bat mitza party, helped to get their drivers' license and coached to finish high school with decent grades. And then...then they join the army to keep the rest of us safe.
" Always make sure that you are never first or last, always finish in the middle." " Try and get accepted to as many courses as can." " It is a pity that you did not tell them you want to become an officer." "Have you ever thought of becoming a career soldier?" " Whatever you do, don't sign to become a career soldier!" Many of the guests started to tell stories of their own army service. Here in Israel, men and women have to serve in the army. Only some religious Jews, Israeli Arabs and expats such as myself have not joined in the "melting pot" of the Israeli army. Sending a child to the army is part of life here in Israel. And it is probably the hardest part of being a parent in this country. I can only echo the posters on the wall and the only words that everybody at the party were in agreement with: תחור בשלום - Come back safely.